Growing up in Cleveland I learned many various lessons, none more important than when I would come across a challenge or crossroads. Such was the case, in what may seem silly now, at a time when I was 4 and standing in my yard. I was no bigger then 3 feet tall and I wanted to climb an extremely large oak tree. I would jump repeatedly up and down trying with every last ounce of my energy to catch the first branch. Exhausted and frustrated I let out a high piercing scream that generated panic in my mother who heard the scream from inside the house. Racing to my aid and thoroughly giving me the once over for possible fever, lacerations, or broken bones, she was perplexed when she discovered nothing was wrong. “Why on earth are you screaming?” she said looking at me with her enormous brown eyes. “Because I can’t climb it,” I sniffed, pointing to the dreaded slender old oak tree. Disappointed and having climbed the swing set before due in part to the fact that there was a ladder which made it easy for me to get up the slide, I dried my eyes and scampered up to the top of the swing set from the slide refusing to use the ladder and never letting the behemoth tree disappear from my sights. Now I am a smart girl, or my grandparents lied to me. But I should have been able to achieve the desired goal of my preschool self, hence the ladder from the swing set. I couldn’t see it because I could never push past the fact it was a BIG tree. We would eventually move from that house and I would never have the chance to climb the daunting oak. However, I would climb other oaks and maples just as big and metaphorically face challenges throughout my life that would require me to overcome the BIG thought process. Still, I used to think of that dumb oak from time to time until one day on a visit home I decided to drive past the old house. I remember being excited about seeing the forty-year-old domicile and couldn’t wait to see the huge front yard loaded with trees and the giant hill the aged split-level sat on. Driving down the street, I felt a nervous pang in my heart at the excitement of seeing the memories of my youth. Filled with hundreds of snippets racing in my blurred memory, I pulled up slowly to the address. “Wait a minute,” I thought. “This can’t be the house.” Yet it was. I was stunned, and as I rubbed my eyes in disbelief I thought, the hill I had taken my sled down had to have been MUCH bigger! The yard was not nearly as vast and wide, and the final blow, the scourge of my 4-year-old existence was not as tall. Adding to further my heartbreak, if I used my current adult height (nearly double that of my 4-year-old self), I could reach up and touch the first branch! As I grew up I came to the understanding that nothing in life is ever as big as it appears: not a tree, a hill, or a challenge. Visiting the house simply cemented that theory. I know I am being long-winded getting to my point, but look at the current situation the country is in. Is it really as big as one may think? If it is change we want-- is it just the President we have to vote out? I ask this question in order to present a challenge. I looked deeper and I recalled a Twitter conversation with a South Floridian friend. He was telling me about a candidate in Florida’s 20th district he liked and I knew nothing about. I literally gasped when I saw who held the current congressional seat. My answer would come in the form of a woman who has been a small business owner and had moved to South Florida as a child. 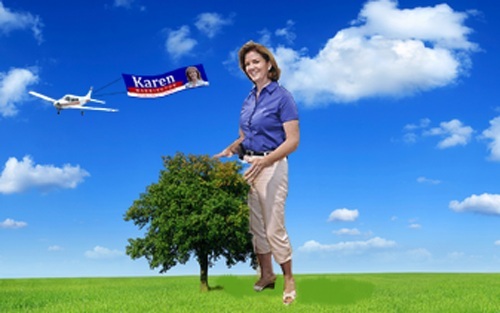 Searching through Karen Harrington’s website (KarenHarringtonForCongress) and plowing through YouTube videos available on her (just by searching name), I became impressed by her accomplishments. I was mostly taken in by the campaign motto “Fire Debbie”. “Wow! How big is that?” I thought. Well….Not really. Just like climbing trees and facing challenges, nothing is as big as it appears to be. What once may have looked too big to tackle eventually comes into focus, allowing the learning and growth it takes to go after the goal head on. If Karen thought something was too big, then she and her sisters wouldn’t have taken the humble family-run restaurant Ricky’s and expanded to three locations employing hundreds of employees. If she thought raising a family was tough, she wouldn’t have gotten married and had three children. If Karen thought she wouldn’t survive, she wouldn’t have beaten cancer. And if she thought challenging Debbie Wasserman-Schultz was too huge, she wouldn’t be running for Congress in a democratically saturated area again even after losing to Wasserman-Schultz in 2010, not to mention garnering the endorsement of Mark Levin. Karen is standing up and taking what she has already accomplished in life and adding the fight for change in this country. Just imagine, if Karen were to take this seat away from Wasserman-Schultz, the impact it would have if at the same time the President were voted out of office. The reverberation would be huge. Wasserman-Schultz and the Democratic Party would receive a crushing blow. Karen is not spending her time looking up at a branch and trying to leap up to catch it. She is being smart by looking at the ground around her and then building a ladder to get to the next level. With each rung she places her foot on she is putting this race into focus and breaking down the unreachable branch of the behemoth in Debbie Wasserman-Schultz and slowly cutting her down to size. Whether it is climbing trees or ladders of success, it is the steps we take to diminish the immense size of the desired outcome. Just like the tree I thought was too big, unseating Debbie Wasserman Schultz carried the same perception until I discovered a self-driven woman with love for God, family, friends, community and country. She is doing all this with little or no fanfare outside of the 20th district. Karen, in her own way by taking on this challenge, is an inspiration that should cause us to look within ourselves and act as true patriots. This inspiration can inspire in us the courage to branch out and reclaim the country we so truly love. If she is not afraid to leap from branch to branch, then we shouldn’t be either. Face it, the old adage is true. Perhaps that is why it is called old and not new. Nothing is ever really as big as it seems. She currently blogs on her own site: http://runinmystocking.wordpress.com and has been nominated for a Shorty Award. The author welcomes feedback and comments, and is not affiliated with Karen Harrington For Congress.